Here is another flower, this time made out of carrots. My kids had loads of fun eating these carrot strips off of the flowers competing with each other! I thought it was yet another great idea to make them gobble up carrots. What say? I felt it was very easy to make and so my basic cutting and peeling skills were more than enough to get the desired result!! So a carrot flower it is for Day 5 Week 4 of BM #27. Choose a fresh, healthy and plump carrot. Wash the carrot and chop off both the ends. Peel the carrot length wise. We would need about 8-9 strips for 1 flower. Insert a small carrot chunk into a toothpick. This would be the anchor for the flower. Select 4 long carrot strips and 4 shorter ones. Make a bow with the longer strip and pin it to the toothpick as shown in the picture. Pin 3 more long ones so that each of them is at right angles to the next one. Make a bow with the shorter strip and pin it to the toothpick so that it lies between 2 longer bows. Continue for the remaining 3 short strips. Now it becomes an 8 petal flower. To close the open end of the toothpick at the top, fold a small carrot strip and pin it. Place the flower on a bigger chunk of carrot or any other sturdy base and it would definitely make a center piece on a buffet table. looks beautiful..and a great way to make the kids eat...I am loving these crafts! 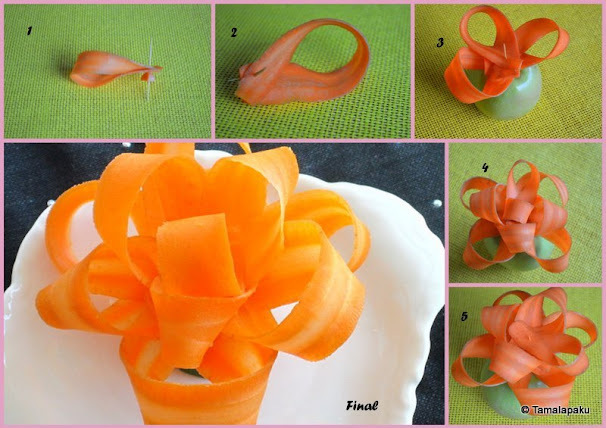 Omg, cute and very pretty carrot flowers, thanks for sharing, now i know how to make flowers with carrot. Looks awesome Harini..guess it's a trick to grate a thin slice right.. Beautifully made carrot flower. Good one. Really looks lovely, though it sounds cliched. I love vegetable carving and love seeing so many new ideas...the flower looks very pretty! Beautiful!!! !Have learnt a new craft today!! Beautiful flower. It will make a lovely centre for our tables. Thanks for the step by step pics.